These days we’re always hearing about how we should eat up more fruit and vegetables and cut back on how much meat we eat. But can we get any essential nutrients from meat? Which vitamins can we get from eating meat and which vitamins must we get from other food sources? If you love eating meat you’ll be glad to hear that you may well find it easier to eat plenty of B vitamins than your vegetarian friends. That’s because, unlike many other vitamins, the B vitamins are not always easily found in plant-based foods. So this is one area where eating meat now and again is likely to help you get your recommended daily allowance, or RDA, of many essential nutrients. Here’s exactly which B vitamins you’ll find in your favourite meat dishes. Vitamin B1, which is good for your heart and nervous system, is found in a wide variety of meats so you shouldn’t have any trouble getting enough of this one. Vitamin B2, which is good for growing bodies and essential in helping your body release energy from food, is in liver and liver products like paté. Eating liver seems to have gone out of ‘fashion’ in recent years, but adding some to your diet now and then can be a healthy choice. Also found in liver is essential nutrient vitamin B3, which is important for building the structure of the skin. Vitamin B5 is a key element in the production of red bloods cells in your body and you can find it in both chicken and beef. So it’s no old wives’ tale that if you’re unhealthily pale, a hearty meal of steak or beef might help put some colour back in your cheeks. Vitamin B6 is necessary for a healthy nervous system and blood function. You’ll be eating up plenty when you go for chicken or fish. So if you are usually a red meat eater, try alternating with these lighter alternatives now and again. Fish is particularly easy to cook and there are so many varieties to try. You’re sure to find something you love. Vitamin B12 helps you release energy from food and is important for the production of red bloods cells. It’s in meat, fish and dairy products. 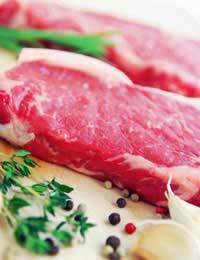 Once again, if you enjoy eating meat, you should have few problems making sure you get enough vitamin B12. Vitamin C, vitamin D, vitamin E and vitamin K are not so readily available in meat or meat products, although you can get vitamin D from oily fish. So you will need to serve plenty of vegetables, grains and fruits with your favourite roast or grilled dish, to ensure you get the little bit of everything you need for maximum health. There’s always a lot of debate in the press about whether or not we should be eating meat and how healthy, or otherwise, it is for us. But whichever side of the fence you find yourself on, it’s true that it’s unrealistic to expect everyone to become a vegetarian. Eating meat is pleasurable and traditional and is likely to be around for generations to come. So if you choose to eat meat, try to do so in moderation, make sure you get a balanced diet that includes plenty of fruits and vegetables and remember that next time you enjoy a satisfying roast or hearty casserole, you’re probably eating up plenty of those all-important B vitamins at the same time.